Summer is the most popular time of year in Yosemite National Park. As the wildflowers fade and the waterfalls start to slacken, vacationers arrive by the thousands. Yosemite weather is usually warm to hot in summer. It rains once in a while, most as afternoon thundershowers, particularly in the higher elevations. You can check the average Yosemite climate or get river water levels, wildflower status and so on at the National Park Service website. 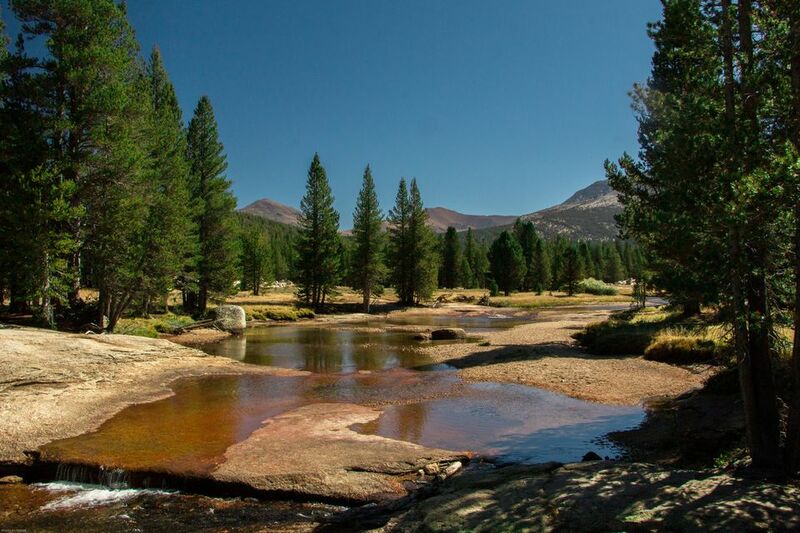 The High Sierra Camps at Yosemite open in July and August. Spaced 5 to 10 miles apart along a loop trail in the high country, they're so popular that you'll have to get into a reservation lottery to stay at them. Applications are available October 15 to November 30 for the upcoming year. Unfortunately, Yosemite has become overcrowded in summer, when it can take as long as three hours just to travel 16 miles from El Portal to the Yosemite Valley. And when you get there, you’ll find a scene at the parking lots that rivals the local mall on Black Friday. There's not much to be done about that except to avoid the park during the summer, especially on weekends. Or head south to Sequoia and Kings Canyon for similar scenery with fewer people. Spring water runoff ends in June, on the average. By August, many of the waterfalls can be completely dry, but Vernal, Nevada, and Bridalveil may trickle all year long. During June and July, you can rent a raft for a float down the Merced River, or bring a non-motorized kayak or small boat. Rafting is allowed between Stoneman Bridge (near Curry Village) and Sentinel Beach Picnic Area. You can't go rafting if there's too much water in the river (more than 6.5 feet deep), or it's too cold (sum of water and air temperature is less than 100°F). The wildflower season moves into higher elevations as summer begins. Mid-June through August bringing the best displays to the Crane Flat meadows and along Glacier Point and Tioga Roads. In Tuolumne Meadows, sub-alpine flowers bloom in late summer. Beginning around July, look for little elephant's heads, gentian, penstemon, yarrow, and shooting stars. If you need help identifying the wildflowers around Yosemite in the summer, try the book Wildflowers of the Sierra Nevada and the Central Sierra by Laird Blackwell. Forest fires are always a possibility around Yosemite in the summer. Even if there's no fire in the park, they can affect air quality and travel to the mountains. It’s a good idea to check for them before you go to Yosemite. The best resource is the California Statewide Fire Map. Just knowing the location of fires isn’t enough. In my experience, it’s hard to tell what conditions are like in a specific spot or even on your way to get there. Your best bet may be to go old school: call your hotel or a local tourism-related business and just ask. The opening date for Tioga Pass depends on the weather and how long it takes to get the previous winter's snow off the road. It usually opens by late May or early June. Glacier Point usually opens in early May or late June, depending on road conditions. All of the Yosemite tours operate in summer, including the open-air tram tours and moonlight tours on full-moon nights. Yosemite Theater offers live evening performances mid-May through October, often featuring Lee Stetson's acclaimed portrayal of John Muir. Cascade Creek: Even in summer, this place is seldom crowded. It's on CA Highway 140 east of the Arch Rock entrance station. It has picnic tables, restrooms, and a swimming hole. El Capitan Meadow: You'll find some nice picnic tables just below El Capitan on Northside Drive. Sentinel Dome: An easy, one-mile walk from Glacier Point Road takes you to a picnic spot that seems like the top of the world. It's especially lovely here if you arrive about an hour before sunset, but bring a jacket, so you don't get too cold and a flashlight in case you get too entranced to leave and need to find your way back in the dark. The National Park Service offers morning Camera Walks starting in mid-April. These free, two-hour tours with a professional photographer can help you learn how to make better photographs of Yosemite in summer. Find out more about the photo walks here.